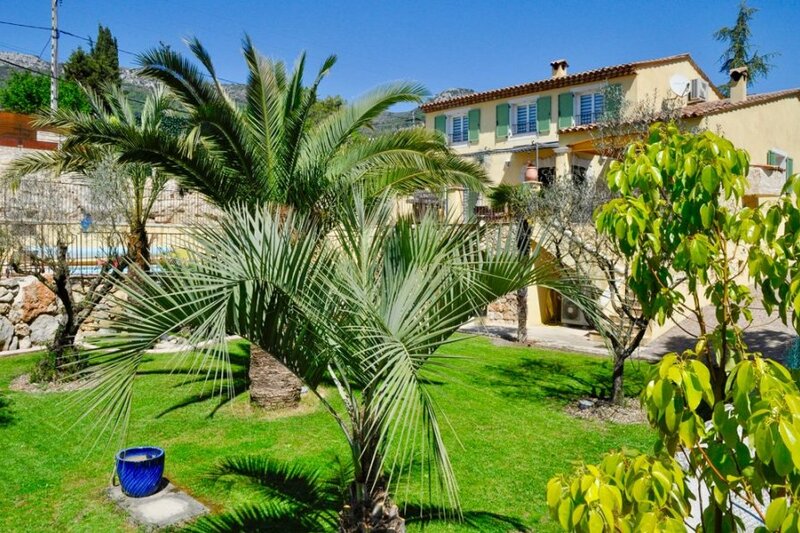 The villa sits on 1000 square metres of terraced grounds filled with bright lawns and pine, olive and palm trees in a hilly and quiet residential area just three minutes' drive from Vence and only 15 minutes from the wonderful beaches of Cagnes Sur Mer, Antibes and the Mediterranean coast. It is beautifully finished using quality materials and in a soothing contemporary style full of space and light. The bathrooms are in lovely natural stone and the villa's large dining terrace has a beautiful pergola for shade. Tourrettes-sur-loup, a picturesque perched medieval village often known as ‘Village des Violettes', located 6km from the property, is highly recommended. It is an authentic hidden treasure surrounded by rolling hills, from Puy-the-Tourrettes up until Col-de-Vence. Allow yourself to be transported back in time while strolling down its narrow streets, admiring the beautiful architecture and exploring the many local craft shops. Don't miss the 'Fetes des Violettes' in March as well as the festivals of St. Arnoux and St.Madeleine which are celebrated in July with a fireworks display and a ball (14th July). Moreover, the 'Festival de la Musique' takes place over July and August!